The Head of John Muir sits on Highway 198 carved out of wood. Mostly known for being a naturalist, preservationist and conservationalist, John Muir was born in Scotland on April 21st, 1838, moving to Yosemite Valley in 1868. There he wrote several writings about preserving natural areas and the environment. President Theodore Roosevelt credited these writings as inspiration to create the U.S. Forest Service and the President even visited Muir in Yosemite in 1903. John Muir was later a big part of creating both Yosemite and Sequoia national parks, as well as other national parks outside of California. He also formed the Sierra Club in 1892, and served as its president until his death on December 24th, 1914. Although some were published after his death, Muir was responsible for 300 articles and 10 books. He is often called the "Father of Our National Park System" as well as the "patron saint of the American wilderness". 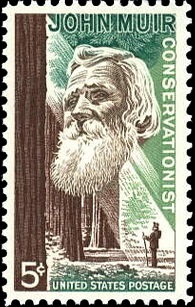 In 1989 in order to commemorate John Muir, his head was carved in a massive wooden sculpture by R.L. Blair. The head was formerly located near Visalia off Highway 99, but is now located close to Lemon Cove on Highway 198 on your way to Sequoia National Park. It is about ten feet tall and carved out of a redwood tree supposedly using a chainsaw. It is joined by two other carvings of Native Americans. R. L. Blair is also the main wood carver for Disney, having carved for the company over 150 sculptures since 1986, with his work appearing at many of their theme parks including both Disneyland and Disney World. His first sculptures were for the Splash Mountain ride. 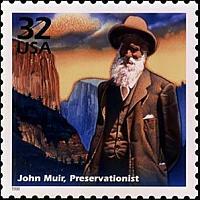 John Muir has appeared on two postage stamps, one a 5 cent stamp from 1964 and the other a 32 cent stamp from 1998. 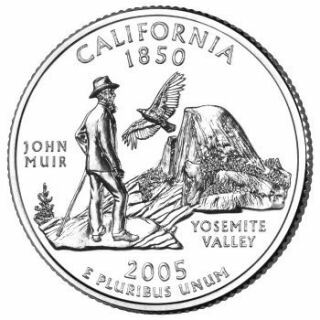 He also appears on the back of the 2005 quarter along with the California Condor. He has numerous places named after him including Mount Muir, Muir's Peak, Muir Glacier, Muir Pass, Muir Woods National Monument and Muir Beach. Additionally he has four trails, a campsite, part of a road, two schools (elementary schools in Berkeley and Cupertino), and even an asteroid named after him. He has his own day in California, April 21st. He was the first person honored as such in California, with Harvey Milk and Ronald Reagan being the only others with their own commemorative days in the state. Muir's birthplace, East Lothian, Scotland also has a day in honor of him.